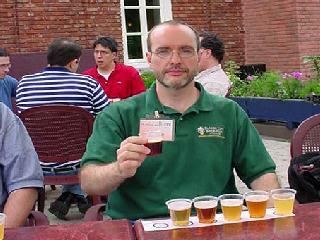 Owen Ogletree took six friends (Dean, Gail, Todd, Carlton, Thel, and Gary) in early June of 2003 up to French-speaking Quebec for a visit to the Mondial de la Bière festival and a tour of the best brewpubs and beer bars in Montreal. Montreal has one of Canada's best specialty breweries (Unibroue) and some extremely interesting English and Belgian styled brewpubs. The Metro subway system makes it easy for the beer fan to make his/her way around the city, and the citizens of Montreal are very friendly and helpful. Mondial de la Bière was one of the most unique and intriguing beer festivals we have ever attended. 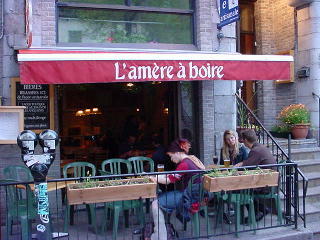 See below for photos and brief descriptions of some of our favorite beer experiences in Montreal. Oh, Canada! What a wonderful experience! Attendees at this festival are able to sample beers from around the world along with gourmet foods, chocolate and port, ciders, cheeses, scotch and whiskey. Admission to this event is free, and samples are available for one to five tickets (tickets cost $1 each). There is an indoor courtyard and a huge outdoor pavilion -- providing plenty of room for the thousands of annual attendees. 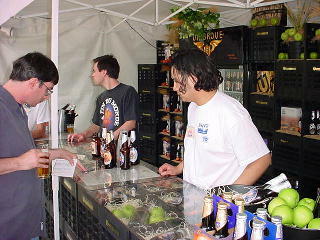 The second picture above shows Gary (one of our group) choosing a beer sample from the beautiful Unibroue table. 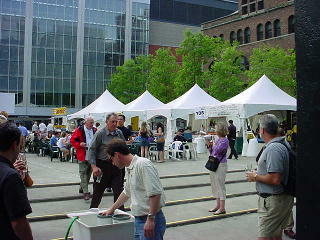 This event is widely considered one of the best beer events in North America, and the 2003 Mondial took place June 4-8. 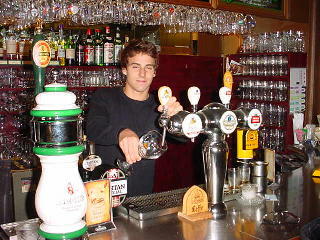 This enjoyable brewpub is part of a French chain with locations in Paris, Lille and Strasbourg. 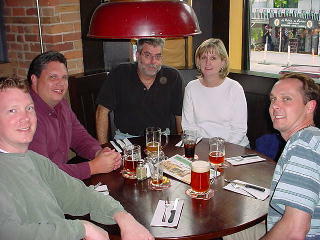 The first picture is of Carlton, Thel, Dean, Gail and Todd enjoying their beer while waiting for our meals to arrive. This brewpub gets high marks for decor, beer, service, and food. 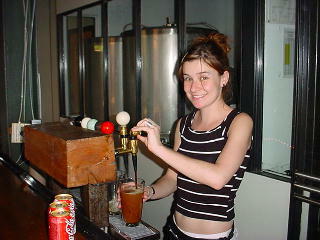 There is a barrel of free roasted peanuts just inside the front door, and the beers are unfiltered and quite flavorful. We sampled a Belgian White, Amber Ale and a Blonde Ale along with our mussels, burgers, and thin, pizza-like Flamm's (crusty flatbread with toppings). The pub has two floors and a relaxed atmosphere and an attractive brick interior. This is a small brewpub with a very tiny brew room and interesting, eclectic decor. From 3 to 8 PM the beers are cheap, and after 8 PM the prices go up. 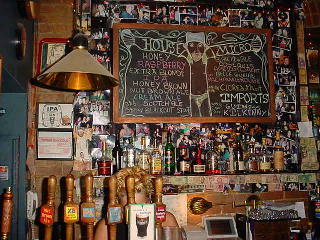 House beers include a Blanche (Belgian Wit), Amber, Noire (a flavorful, dark Stout), Blond, Bitter (dry and fruity), and a Seigle D'Or Rye Ale as a seasonal offering. There are small appetizer plates of food available as well. 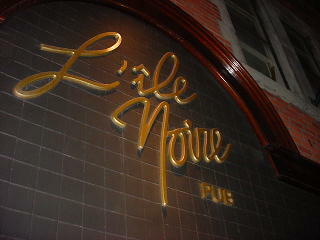 L'ile Noire is a small, dark, cozy beer bar with a very interesting selection of regional microbrews. 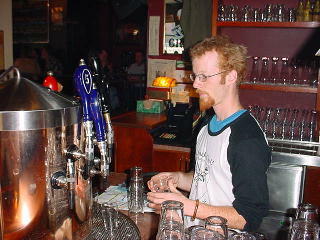 Most of the Unibroue and McAuslan beers are available here along with some pleasant music and an efficient bar and waitstaff. 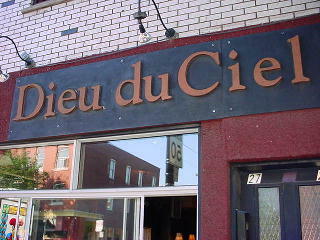 Some of the most flavorful beers we consumed in Montreal were purchased at this small, but personable brewpub whose name literally means "bitter to drink." Their range of beers was outstanding with a Blanche, Cerna Hora Blonde, Ambree Pale Ale (with Maris Otter and crystal malts and Fuggle and Goldings hops), Drak Bière Lager Rousse (red lager), Fin de Siecle (red ale with Maris Otter and Munich malts), and a malty Bock beer and Imperial Stout. One or two of their house beers are usually available on cask (hand-pump) which softens the product and allows the complex flavors to really emerge. The brewpub is filled with light wood, and has a good use of vertical space and a nice mix of people. Tapas (appetizers and small plates of food) are available. 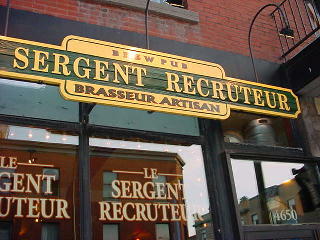 The name of this brewpub refers to a "recruiting officer" in the French army. Sergent Recruteur offers up a Blonde Ale, Cream Ale, Stout, Blanche, Brown Ale, and Red Ale -- all of which are clean, refreshing, and well made. There is a fun, artsy, rustic feel about with place. Stop by on Saturdays for live music. This casual brewpub in the northern area of Montreal (a ten minute Metro ride) produces a staggering array of beer styles (not all of which will be available at one time). One member of our group, Dean, swears that the bottled Imperial Stout at Dieu du Ciel was the best beer he tasted in Montreal (and I think it was definitely up in the top five). We also enjoyed a Blonde, Red Ale, Stout (5% abv), Smoked Ale (very smoky), Spice Ale (with red and black pepper - very pleasant and unique), Stout (at 6% with cacao and vanilla), and Imperial Pale Ale (8% abv and filled with aromatic hops). 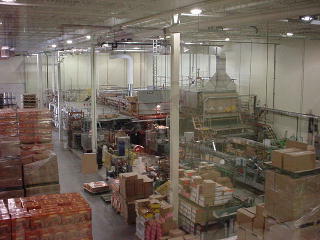 Great food items include: nachos, smoked salmon, pizzas, and pretzels. Both floors of this trendy brewpub were packed with twenty-somethings when we arrived. 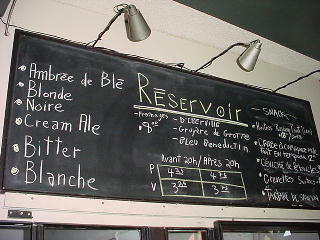 The beers are very well made, and the list seems to fit the standard Montreal brewpub lineup (see the board above). 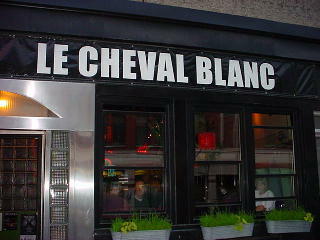 The menu consists of small plates of upscale food items -- very good but small in portion and large in price. Reservoir is definitely worth a visit. This beer bar and restaurant is a must-see in Montreal. It has an attractive interior that is slightly upscale with beautiful windows and a wide, open space for the restaurant and bar. Fans of mussels will be amazed at the entire page of the menu devoted to these delectable mollusks. 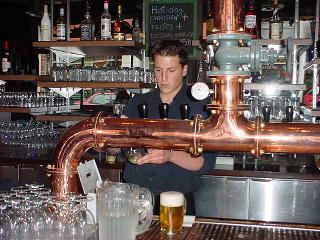 Many entrees are cooked with beer, and the beer menu is quite extensive. McAuslan is a highly-regarded microbrewery in a slightly run-down, but up-and-coming section of Montreal known as Saint-Henri. The brewery has recently moved into its new facility where the McAuslan ales are produced in open fermenters right next to closed fermentation vats of Moosehead lager (which they contract brew for the Quebec market). We sampled: St-Ambroise Pale Ale (nice aroma and bittering hops), Griffon Extra Blonde (not bitter, but more mild and malty than the Pale Ale), Griffon Red (mild with a nutty sweetness), St-Ambroise Oatmeal Stout (chocolate malt and roasted barley character that is dry and refreshing), McAuslan Vintage Ale (10% abv English Style Barleywine that is strong, malty, and fruity). 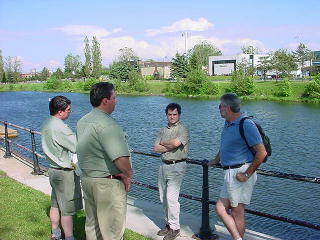 The second picture above shows Gary, Thel, Mario Melillo (of McAuslan), and Dean standing on a grassy area behind the brewery that is being converted into the McAuslan beer garden. 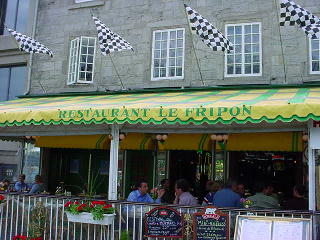 In the touristy area of Montreal's Old Town/Old Port is Restaurant Le Fripon. This place is nestled in the middle of a ton of restaurants and shops, and is very easy to miss. Be sure to stop here for a meal because there is a nice range of food -- mussels, seafood, sandwiches, meats, and chicken. The size of the beer menu is quite surprising with over 100 beers from around the world, including many top brands from Belgium, England, and Canada (but the only US beer on the menu is Budweiser!). Try a strong ale from Belgium such as Chimay, Duvel, or Delirium Tremens -- but be careful because some of the beers are pricey. Unibroue microbrewery is about 18 miles from downtown Montreal in the small suburb of Chambly (around a $60 taxi ride each way in 2003). 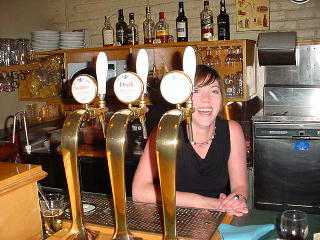 They have produced Belgian-styled, bottle conditioned ales of unsurpassed quality since 1993. 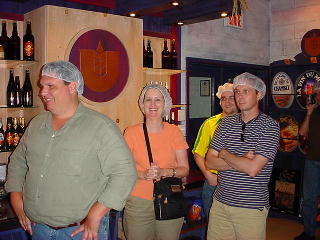 The second picture above shows Thel, Gail, and Todd wearing their dreaded hair nets in preparation for the brewery tour. Many of the Unibroue beers incorporate specialty malts, fruits, and/or spices; and some of their ales can be quite potent in regard to alcohol content. Each beer has a colorful and characteristic label and name that usually has its origin in some aspect of Quebec folklore. Tours of the brewery can be arranged through their restaurant (see the next listing below), and information on all their excellent products is available on their website at www. 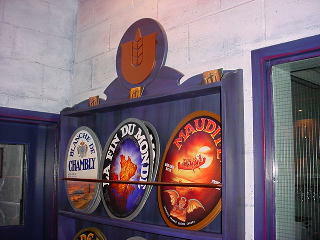 unibroue.com. 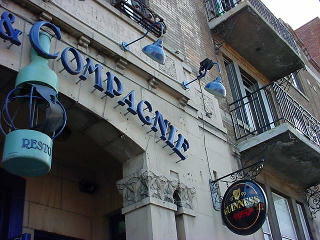 This is the marvelous French restaurant associated with the Unibroue brewery discussed above. 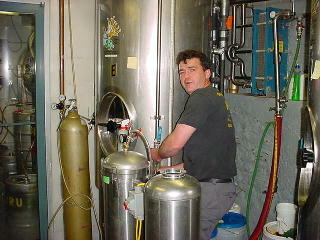 Call Fourquet Fourchette to arrange a tour of Unibroue followed by a beer tasting and meal at the restaurant. 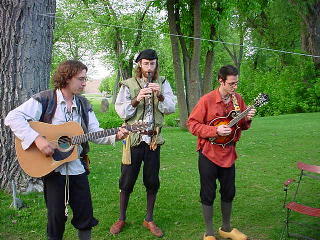 The waitstaff is dressed in 17th century attire, and the strolling musicians are quite entertaining as well. But the main attractions of Fourquet Fourchette are the food and the Unibroue beers (many of which are used in the preparation of the entrees). The food is exquisite, and each entree comes with a salad and dessert. 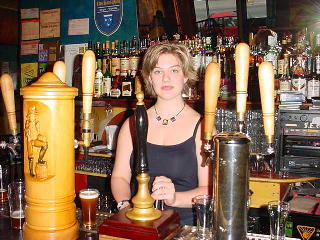 If you are unfamiliar with the Unibroue beers, the waitstaff is eager to help you choose a beer to go with each food course. Be sure not to miss the gift shop where one can purchase delicious cheeses from Quebec and all the Unibroue beers. Just a five minute drive from downtown Montreal is a fantastic supermarket owned by a local beer lover. Metro Joannette market makes a great attempt to stock all interesting beers from the regional brewers in Canada. Grab a street map of Montreal or give them a call at the number listed above so you can pay them a visit -- the inexpensive prices alone make this a mandatory stop for any visiting beer lover. "The Metro system in Montreal will help you get around the city for some of the places mentioned -- leaving you less in need for your beds leaving more time to enjoy the city!"